Tiny, about 1/6-inch in length; reddish brown and flattened. 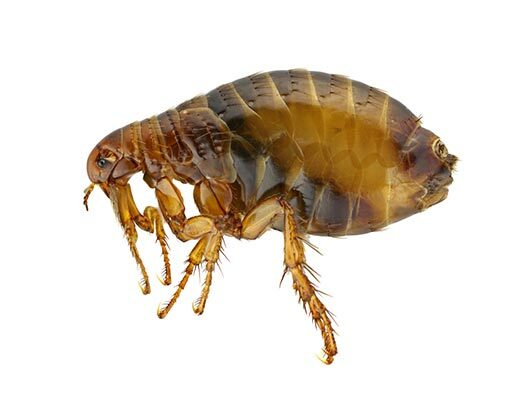 Fleas live on the bodies or animals and feed on their blood. Because fleas usually feed and lay their eggs while an animal is sleeping, your pet’s resting area is where the most fleas will be found. Many pets acquire fleas outside in the yard. The cat flea will attack both cats and dogs. Its flat shape allows it to pass easily between animal hairs. Larvae feed on organic debris, particularly the faeces of adult fleas, which contain undigested blood. Females need to feed on animal blood in order to produce eggs. Controlling a flea infestation requires treating your pets, the inside of your home, and flea activity sites outside. To treat pets, consult your veterinarian and follow the instructions of recommended flea control products. To treat inside your home, remove all items from the floors and vacuum, wash and/or mop thoroughly. Wash or replace pet bedding. In homes with an active flea infestation, professional treatment is advised. Because flea pupae are not affected by treatment, it may take up to two weeks after treatment before fleas are no longer seen.